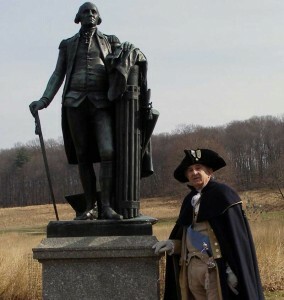 Carl Closs, who has portrayed George Washington for the last 15 years and for many in the area is now the living embodiment of the founding father, is seen with the statue of the general and first president of the United States at Valley Forge. A name immediately recognizable by every American, Valley Forge will be linked forever with our struggle for independence. Although its been romanticized in history books for decades, few people know how perilously close to failure George Washington came there. The story behind this sacred place- and the men who suffered here- is one of faith, fortitude and inspiration. Walking in their footsteps today is a special event- made fascinating by being with “living biographer” Carl Closs, who’s portrayed General Washington for the past 15 years. Closs not only looks like Washington, dressed in full uniform and dark blue greatcoat- he IS Washington as you walk with him and talk about “the cause”- the struggle against Great Britain. The place we know as Valley Forge got its name from the Mount Joy Iron Forge operated by the Potts family, built on the east side of Valley Creek. The region had a number of successful industries: a grist mill, saw mill, a blacksmith and wheelwright. In the late Fall of 1777, George Washington was planning to set up camp there because a cache of supplies had been left for him after the Battle of the Brandywine. However, the British arrived first, seizing the supplies, destroying the forge and burning houses. All that remained was a bare plateau. 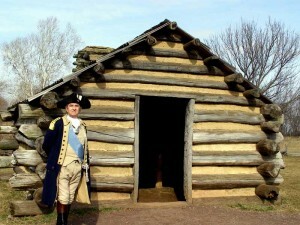 Carl Closs portrays George Washington, seen here in front of one of the tiny log huts built by soldiers at Valley Forge. Washington spent six months at Valley Forge (from December 19, 1777 to June 19, 1778). Although at times their cause appeared to be lost, he was dedicated to his troops, insisting at first on sleeping in a tent to show solidarity with them. 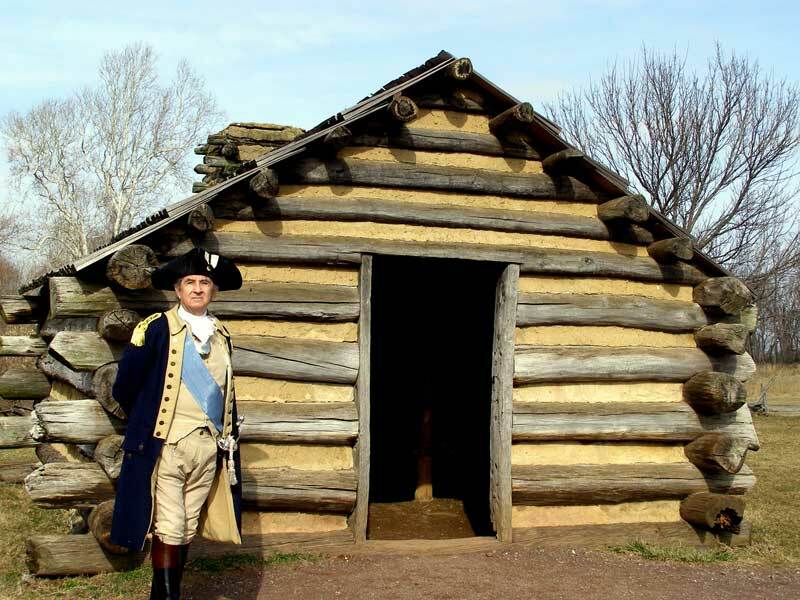 They revered the General and labored to build hundreds of wooden huts on plans designed by Washington himself. Visitors today can walk inside replicas and see the Spartan conditions they lived in. The General set up headquarters in a house owned by Isaac Potts. Initially an army of around 12,000 men, more than 2,000 died over the Winter due to disease. Dysentery and typhus were rampant; horribly unsanitary conditions surrounded them, filth and rotting carcasses everywhere. A situation like this would be considered intolerable by any modern army- but they survived. Today the National Park gets thousands of visitors every week, 235 years after weary soldiers left bloody footprints in the snow. At Washington’s Headquarters is a large bronze statue of the General, standing tall with his sword in his right hand, his left hand near a plow- showing he planned to return to his farm after the war, as many patriots did. Closs strolls up to the statue, discussing the incredible bravery of the men. He later walks under the Memorial Arch erected in 1913 to honor the troops. He is the embodiment of the General, extolling his virtues of humility, honesty, integrity and courage under extreme circumstances which would have caused most men to give up. Closs points to an engraving on the side of the arch which reads “Naked and starving as they are, we cannot enough admire the incomparable patience and fidelity of the soldiery…” No shots against the enemy were fired here. More importantly, Valley Forge is a story of determination and faith in almighty God. Washington believed in Divine Providence guiding him and his men to endure and fight another day. If you visit the Park, take some time to see Washington’s statue and walk under the arch where you can feel the presence of those who struggled and died, giving us the freedom to be here today. To reach Carl Closs, go to www.GWashington.net. For more information on the author of this article, visit his website at www.GenePisasale.com or e-mail him at Gene@GenePisasale.com.